← The Greek Election: Eve of Destruction or Dawn of Correction? That was her cue to turn to me with a smile on her face and love in her eyes and say something like, “Me too. It was wonderful.” Then she would reach over, take my hand, and give it a little squeeze. Was it possible that she had forgotten? It was one of those unforgettable moments in a couples’ life together. We had just come from making arrangements for our wedding at a little church just outside of Milan. It was close to noon, so we decided to stop for a bite to eat. The little old dinner downtown seemed somehow more romantic than one of those burger joints. The love of my life is one of those unique people who remembers everything and forgets nothing. I learned long ago that I must be very careful of what I say. Always compliment; never criticize. Don’t ever even consider playing a game of trivia with her. You will surely be embarrassed. I remember the time a group of seminary students challenged her to a game of Bible trivia. When they began, the seminarians all had the sort of smile on their faces that only a Calvinist would understand. When the game was over, her opponents were no longer smiling. It never occurred to them that a mere young lady raised a Southern Baptist could humble them so. They left with their heads bent low and their shoulders sagging. I thought I heard one mumble something about switching to a MBA program. Of course this is all in jest, most of it, that is. 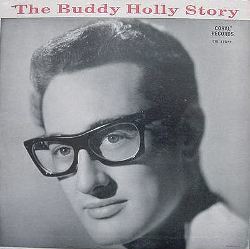 On a more serious note, today is the seventy-sixth birthday of Charlie Hardin Holley, better known as Buddy Holly. For those who are not old enough to remember, he was one of the singer-songwriters who helped birth Rock n’ Roll during the mid-fifties. “That’ll Be the Day” (1955) and “Peggy Sue” (1957) are perhaps his two best known recordings. I close with an apology. It has been more than a month since my last posting. Other writing commitments got in the way, leaving me with little time and even less inspiration. My goal is to do better in the future. This entry was posted in Opinion & Editorials. Bookmark the permalink. Loved it Paul. As I said in my last blog post, “I’m mentally putting together all the things I did through the years which I have carried with me to this place in my life. Little did I realize that everything was a memory making experience. Now I pull up those memories at will and relive them.” That’s what we are all doing, every day…building memories. You two are blessed to have had 32 years together. You have to understand, I was responding to the lyrics of the song, not the memories that go with it. Poor Olivia, singing her heart out that she loves the guy and she realizes he doesn’t love her back. But I do remember being in the cafe, listening to the guys teasing about eating road kill,holding hands and listening to Paul wondering if we should be eating there at all if they were cooking brains on the same grill as his food! Realize, my brain is very selective – the trivia side and the music side is very good. The section with real life names is severely damaged and it takes a lot of effort to remember any. Wish it wasn’t so. And yes, Mary Jo, I am truly blessed, packed down and running over, with a wonderful husband.